Verderflex rapide tube pump doses a small amount of organic lubricant, called ecodish, every hour to the circulating water. At the end of its’ life, a car yields on average, 140 kg of shredder waste: 26 kg of metals, 69 kg of plastics, 11 kg of minerals and 24 kg of fibres. Verderflex Dura 45 hose pumps circulate copper parts in a settling tank. This prevents copper parts from settling at the bottom of the tank. The plant was built in 2011, for the recycling of cars. In 2015 their goal is to recycle 95% of end-of-life vehicles. The last valuable material recovered is from shredder waste in the plant, which is crucial in order to fully achieve the legal objective. Today ARN has already reached this goal by separating about 40% of all shredder waste from cars. 56% of the remaining shredder waste is incinerated with energy recovery: just 4% at the most ends up in the landfill. The separation process is accomplished by a large number of different techniques. 179 different machines are used to screen the waste, cut it in the hammer crusher and centrifuge the waste particles to enable separation of the shredder waste. Sink-or-swim tanks are also used to separate materials with different specific gravity from one another. Huge mega magnets are used to separate the larger metallic parts. Most techniques consist of innovative technical airflows in cyclones of different nature (eg, swirling, air blowing under or above or sideways), feeding or just by draining fluids. Also settling and circulation of fluid streams (for re-use of the process materials such as calcium carbonate) are recurring techniques. Plastic waste is separated by circulating water. The plastic floats and is pumped out by a Verderhus screw centrifugal pump. In the last stage of separation, several materials are separated in fluid stream baths, using a difference in specific gravity. 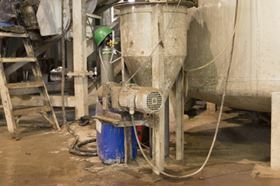 Calcium carbonate, powdered limestone, is circulated in a settling tank. Since this material is heavy, it will settle after 30 minutes. In order to keep the calcium carbonate from sticking to the bottom, a Verderflex Dura 45 hose pump is used to keep the fluid stream moving. Since its installation in 2013, the Dura 45 has been pumping around the clock, without requiring a single hose change. Copper parts are circulated by a stirrer in a settling tank. The copper parts are pumped into another tank by a specific movement of the stirrer. Due to the high gravity of copper, the copper parts settle at the bottom of the tank and every two weeks the tank has to be cleaned out manually. For this application, ANR purchased 3 Verderflex Dura 45 pumps, and used them as circulation pumps. This prevents copper parts from settling at the bottom of the tank and are pumped into another section of the separation process. Plastic waste is separated by circulating water. The plastic floats and is pumped out by a Verderhus screw channel pump. After many trial pumpings, the Verderhus, with its half open screw impeller, pumps plastic into the plastic containers. Verderflex Rapide tube pump doses a small amount of ecodish every hour to the circulating water. Ecodish is an organic lubricant, which lubricates the plastic even more to make it float away faster and smoother.